... this is Don's 3rd shot on 15. 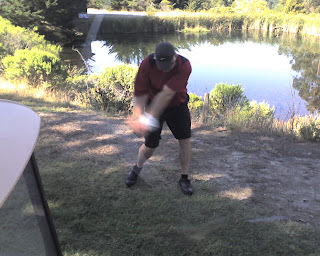 And here is Don taking his 5th shot on the 15th, and yes that is the same body of water as in the first picture. He is only about 100 yards in front of the tee. 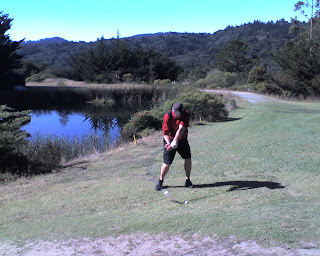 After eight strokes, he was still in the weeds off to the right of the green when he finally picked up. No telling what his actual score was. ... this was my birdie (and par) putt. It was a good hole.